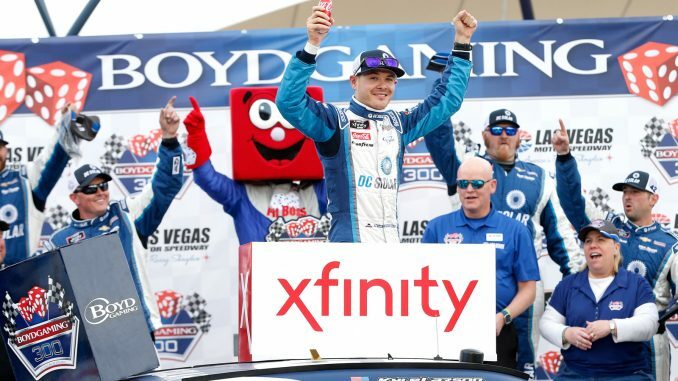 LAS VEGAS, Nev. – Kyle Larson pulled away from pole winner Christopher Bell after a restart with seven laps left and took the checkered flag in Saturday’s Boyd Gaming 300, winning for the first time at Las Vegas Motor Speedway in the NASCAR Xfinity Series. Larson beat Bell to the finish line by .881 seconds. The driver of the No. 42 Chip Ganassi Racing Chevrolet led 142 of the 200 laps and overcame a pit road snafu that dropped him to eighth for a restart on Lap 139 after a caution for Austin Cindric’s crash in Turn 2. The victory was Larson’s first of the season and the ninth of his career. Nor did it take him long to recover after the slow pit stop on Lap 135 that set him back. “Normally my guys are some of the best on pit road,” Larson said. “They said the left-rear (tire) just wouldn’t come out (of the wheel well). I had been fighting a tight issue all day and then finally we got our car to turn better. Larson and Bell are frequent rivals in dirt-track racing, and Bell had the upper hand in last November’s Turkey Night Classic and January’s Chili Bowl, the marquee midget race of the season. Bell was happy to see the friendly rivalry extend to pavement. “That was really cool, and there will be a lot more of that,” promised Bell, who outdueled Larson at the end of Stage 1 but fell short after the final restart. “We were close, running second to Kyle – if I’m going to run second to anyone, I guess I would rather it be him. Justin Allgaier ran third in the No. 7 JR Motorsports Chevrolet. Ryan Blaney was fourth, followed by Elliott Sadler. But the show at the beginning and at the end was Larson vs. Bell. “It’s always fun to get to race Bell,” Larson said. “He seems to beat me all the time in the dirt stuff, and he edged me out there in qualifying. We were pretty equal there… It was cool to race, though. Trying for a weekend sweep after winning Friday night’s NASCAR Camping World Truck Series event, Kyle Busch fought an ill-handling Toyota throughout the race and finished 14th after his fueler drew a penalty for handling a tire during a green-flag stop on Lap 166. Daniel Hemric, Brandon Jones, Tyler Reddick, Cole Custer and Las Vegas native Spencer Gallagher completed the top 10. Reddick and Sadler leave Las Vegas tied for the series lead, 23-points ahead of Bell in third. 1. (2) Kyle Larson(i), Chevrolet, 200. 2. (1) Christopher Bell #, Toyota, 200. 3. (12) Justin Allgaier, Chevrolet, 200. 4. (8) Ryan Blaney(i), Ford, 200. 5. (6) Elliott Sadler, Chevrolet, 200. 6. (3) Daniel Hemric, Chevrolet, 200. 7. (16) Brandon Jones, Toyota, 200. 8. (7) Tyler Reddick #, Chevrolet, 200. 9. (4) Cole Custer, Ford, 200. 10. (11) Spencer Gallagher, Chevrolet, 200. 11. (9) Matt Tifft, Chevrolet, 200. 12. (10) Austin Dillon(i), Chevrolet, 200. 13. (19) Michael Annett, Chevrolet, 200. 14. (5) Kyle Busch(i), Toyota, 200. 15. (17) Ryan Truex, Chevrolet, 200. 16. (18) Kaz Grala #, Ford, 200. 17. (24) Alex Labbe, Chevrolet, 200. 18. (14) Ross Chastain, Chevrolet, 199. 19. (13) Ryan Reed, Ford, 199. 20. (23) Joey Gase, Chevrolet, 197. 21. (29) Josh Williams, Chevrolet, 197. 22. (20) Jeremy Clements, Chevrolet, 196. 23. (26) Garrett Smithley, Chevrolet, 196. 24. (37) Vinnie Miller #, Chevrolet, 196. 25. (33) Tommy Joe Martins, Chevrolet, 195. 26. (34) BJ McLeod, Chevrolet, 195. 27. (27) Matt Mills #, Chevrolet, 194. 28. (39) Josh Bilicki #, Toyota, 189. 29. (21) Ryan Sieg, Chevrolet, Engine, 185. 30. (40) Stephen Leicht, Toyota, 185. 31. (38) Mike Harmon, Chevrolet, 183. 32. (30) Chad Finchum #, Toyota, Suspension, 140. 33. (25) Timmy Hill, Dodge, Power Steering, 134. 34. (15) Austin Cindric #, Ford, Accident, 132. 35. (35) David Starr, Chevrolet, Engine, 78. 36. (31) Spencer Boyd #, Chevrolet, Suspension, 70. 37. (36) Morgan Shepherd, Chevrolet, Oil Leak, 24. 38. (28) JJ Yeley, Chevrolet, Vibration, 18. 39. (32) Jeff Green, Chevrolet, Brakes, 15. 40. (22) Dylan Lupton, Ford, Accident, 5. Average Speed of Race Winner: 131.884 mph. Time of Race: 2 Hrs, 16 Mins, 29 Secs. Margin of Victory: 0.881 Seconds. Lap Leaders: C. Bell # 0; K. Larson(i) 1-42; C. Bell # 43-48; K. Larson(i) 49-94; R. Blaney(i) 95-127; K. Larson(i) 128-135; C. Custer 136-139; J. Allgaier 140-151; K. Larson(i) 152-186; T. Reddick # 187-189; K. Larson(i) 190-200. 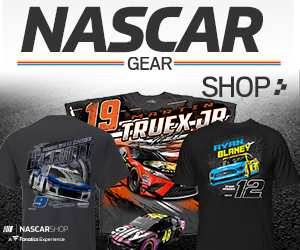 Leaders Summary (Driver, Times Lead, Laps Led): K. Larson(i) 5 times for 142 laps; R. Blaney(i) 1 time for 33 laps; J. Allgaier 1 time for 12 laps; C. Bell # 1 time for 6 laps; C. Custer 1 time for 4 laps; T. Reddick # 1 time for 3 laps.